For first time giant pumpkins growers transporting a pumpkin may not have been something you would have thought much about, until now, when it is almost time to get this rather large vegetable you have grown from out of the garden/patch and take it you a competition or maybe just take it to work or a friends house to show them how awesome you are. For something on the smaller end of the scale people power is the order of the day. 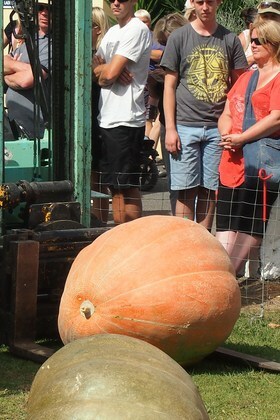 If you have enough people you can move a pumpkin around that is in the 200kg range. Now keep in mind I said move, lifting a pumpkin can be a whole different story. 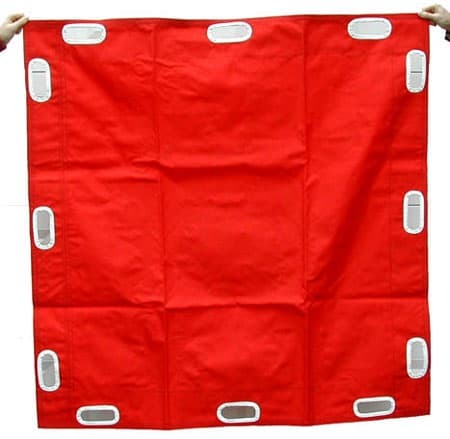 A strong sheet like item or a tarp. People willing to help you out, the more the better and get strong people if you can. 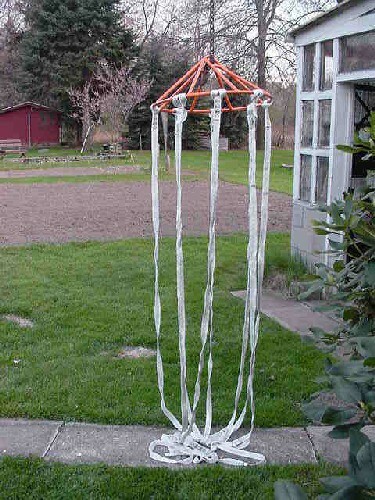 A pre made pumpkin lifting tarp from the US. My pumpkin lifting tarp made from canvas. 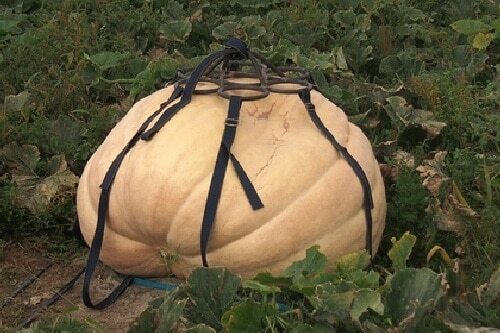 Pumpkins lose moisture and will lose weight once cut from the vine, so if you are going for weight at a competition cut it on the morning or as close as possible to when the event is going to happen. Leaving part of the stem attached and covering with a wet cloth, or attaching jars of water to these ends can help prevent moisture loss, trim it up before it gets onto the scales. 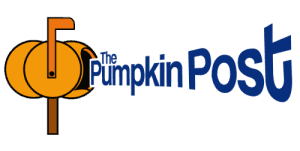 You will want to remove all the vines immediately around where the pumpkin is, to make access for everyone easy and to remove the chance of scratching or damaging your pumpkin. 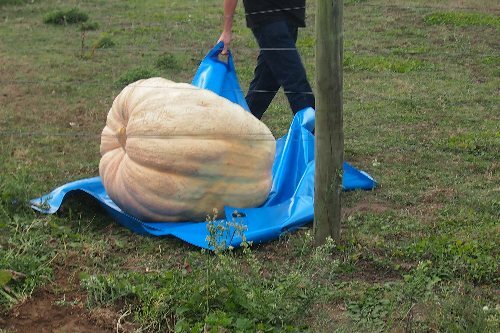 The aim now is to get the sheet/tarp you are using underneath the pumpkin, rocking it and getting the pumpkin up on one side while someone puts the sheet/tarp down rock the pumpkin the opposite way and get it into the centre of the sheet/tarp. Once you have done this a couple of times getting pumpkins on top of a sheet/tarp is a breeze. 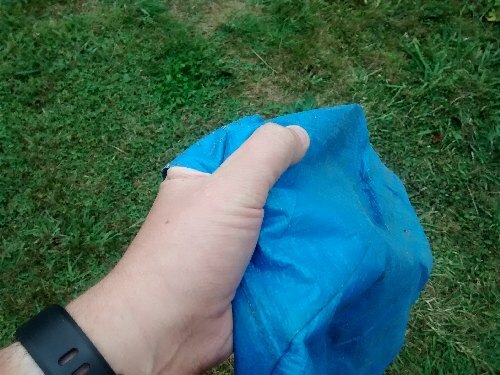 If the sheet/tarp is too big, people may need to grab a lot of it which may make slipping out of people’s hands more likely. 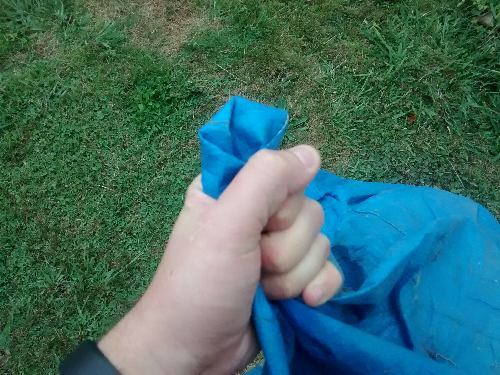 If the sheet/tarp is too small people may strain themselves by lifting low to the ground, or there is potential to squash fingers and hands as it is lifted. I find grabbing a bunch of the sheet/tarp and pulling up with a closed fist a lot more effective then just holding the edge. Before lifting see what works and feels best for you. Next up is getting the vehicle or trailer as close as possible to the pumpkin, think about the movement of getting the pumpkin from where it is into or onto the vehicle or trailer, think about the terrain and what would work best for everyone. Teamwork and good communication is what is needed next, make sure there is one person calling the shots, which is usually the grower. Make sure that if there is something not going right or it appears it is about to drop or fall off that everyone gets the call to put it down gently, reposition and try again. 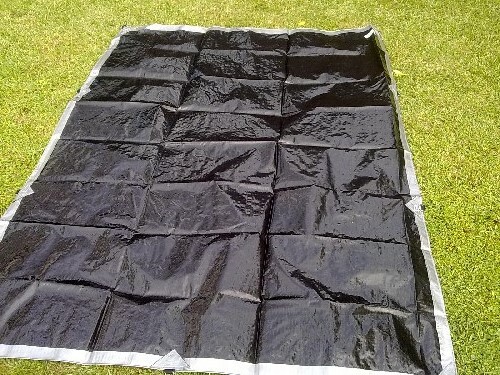 It is usually a good idea to keep the sheet/tarp with the pumpkin to make moving it at the other end just as easy, one item I have seen time and time again is people using a duvet, this helps with moving and also protection on it’s journey to the event. Pack lots of soft material around the pumpkin and make sure it doesn’t move too much in the transit. My pumpkin the boot of my car with the tarp. 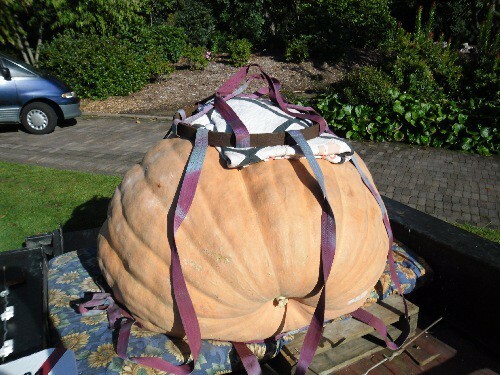 If your pumpkin is on a trailer or ute you will need to tie it down, I will talk about that in the next section on the really big giant pumpkins. 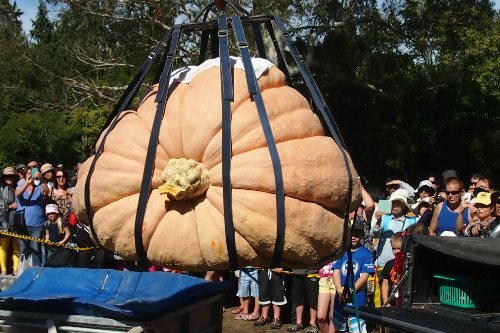 If your pumpkin is well over 200kg’s and approaching 700+ then you will probably need a different type of technique to move them and get them onto your transport. 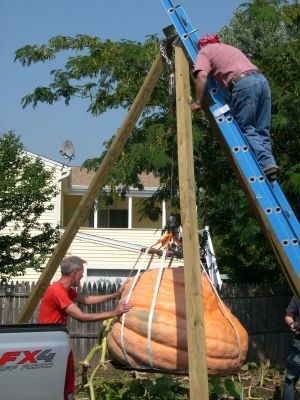 Some people overseas will use a giant tripod type structure with a pulley system underneath it to lift the pumpkin high enough to get a trailer or vehicle underneath it. I haven’t heard or seen of anyone here in NZ using that setup, but if you have send through some photos I’d love to see it. The other way of doing it is either via a tractor (there seems to be a lot of them around) a forklift, or a truck with a Hi Ab, and with all four of these methods there is something else that is needed. Some sort of lifting straps. These will go down the sides of the pumpkin and are connected at the bottom by another strap which is tied off. This supports the pumpkin enough to be able to lift it up and move it around. 6 – 8 straps coming down are common, you want enough to make sure the pumpkin doesn’t slip out and the weight is distributed evenly. 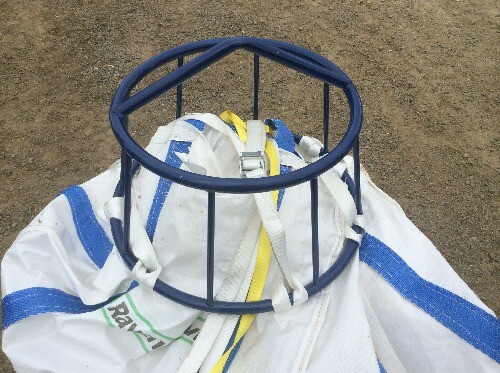 A ring or frame type structure is used at the top, this keeps the straps apart instead of all going to one point as this can produce some harsh angles on the pumpkin which in turn could damage or break it. A standard looking lifting ring set up. This is the frame I had made last year, it works and we haven’t broken it yet, although I did learn the importance of drawing what you want properly. Here is Tim’s in action with his pumpkin. Just like the smaller pumpkins removing the surrounding vines will help you gain access to the plant, you want to get your bottom strap nice and snug under your pumpkin and have it tied off well so it can stay put when the weight goes onto it, if when lifting there is some movement or something doesn’t seem right reduce the tension, recheck and move straps if you need to. 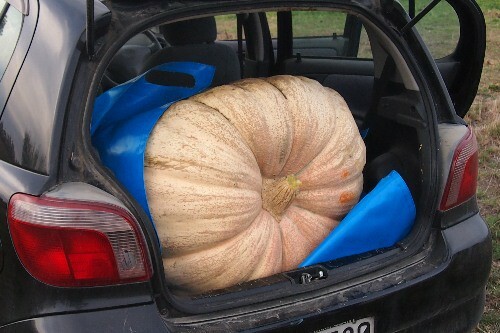 For smaller sized pumpkins I have seen these turn up in all sorts of vehicles, I’ve even put them into all sorts of vehicles. As I said above having the lifting sheet/tarp already underneath the pumpkin sure does make it easier at the other end to get it out. 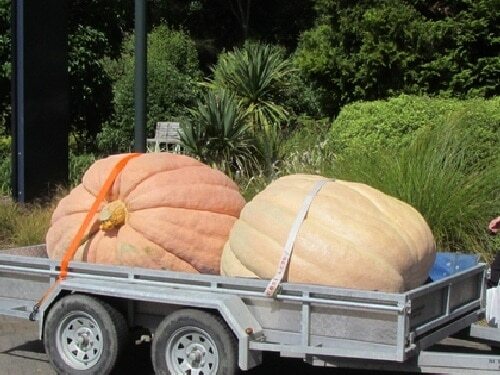 For the really big pumpkins you will be either using a ute, a trailer or a truck. Each one involves lifting the pumpkin onto the tray or deck of the vehicle. Having spotters on either side while it is slowly being put down is super helpful. A lot of the newer Utes have a slightly smaller tray due to the wheel wells being part of the inside, you may need to think about putting pallets or something to raise the bed where the pumpkin can sit. When you do this it can dramatically effect how your vehicle can handle especially in braking and cornering. You may also need to do the same with either a trailer or a truck deck as sometimes the pumpkins can be wider. These just fit inside the trailer. Tie down straps are a good choice for strapping down your pumpkin, they are easy to tighten up, easy to undo and with enough and give enough peace of mind that the pumpkin will stay put. Putting something underneath the straps so they don’t touch the pumpkin directly is a good idea and can also help spread the pressure across the pumpkin as opposed to one point. Polystyrene blocks, more duvets, whatever you have on hand can help here, just make sure it is soft. If you are going to a newish event or you know that your pumpkin is bigger then anything you have seen there before then contacting the organisers about your requirements is a must. 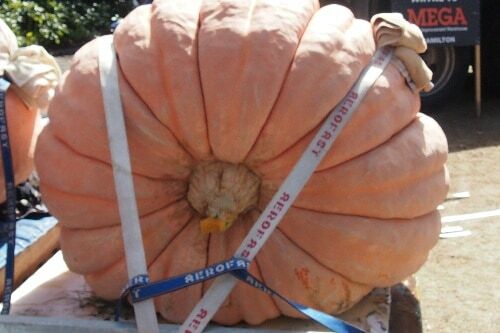 There is nothing worse then turning up to an event and not being able to get your pumpkin weighed. If a forklift is used at the event having your pumpkin on a pallet is the best option. I have seen pumpkins lifted with just the forks and it made me cringe, both from a safety point of view and the potential damage being done to the pumpkin. 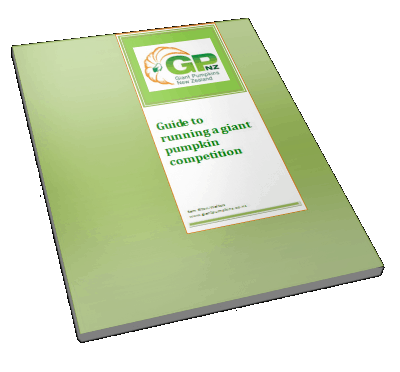 Remember you will still need to get your pumpkin off the pallet and onto the scales, having nothing but the pumpkin on the scales gives the best fairest weight and is a requirement at GPC weigh offs. Remember to take your time in the transportation and moving of your pumpkin, ask for help if you need it and stay safe.